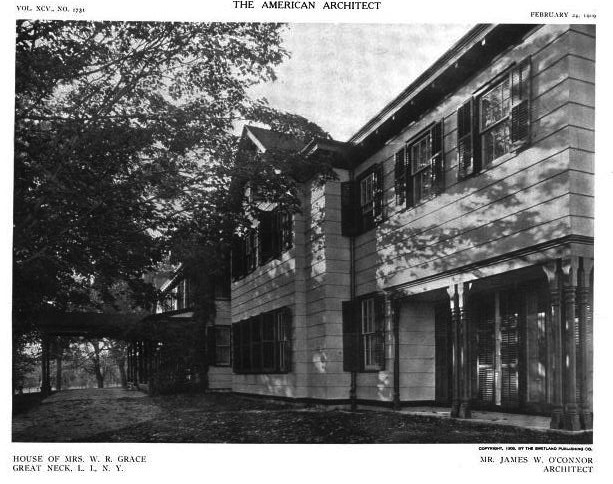 'Gracefield', the Mrs. William Russell Grace Sr. estate designed (enlarged and altered) by James O'Connor c. 1909 in Great Neck. 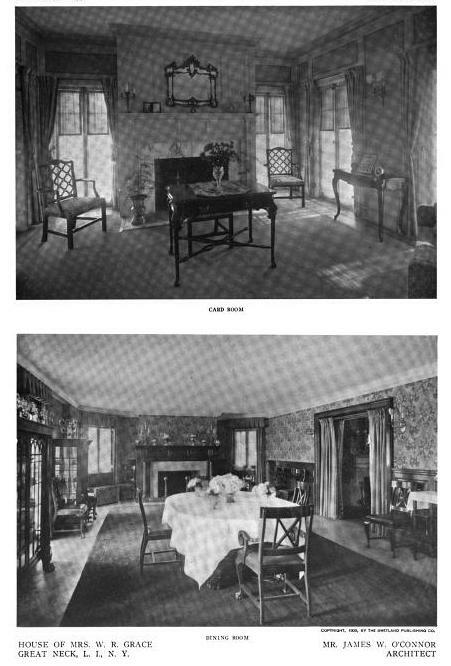 Grace was a two term mayor of New York City and co-founder of William R. Grace & Co. His son W.R. Grace Jr. resided at 'Crossroads' in Old Westbury, daughter Lillian Grace Kent at 'Jericho House' in Jericho and son Joseph P. Grace at 'Tullaroan' in North Hills. Click HERE to see 'Gracefield' on google earth and HERE on bing. 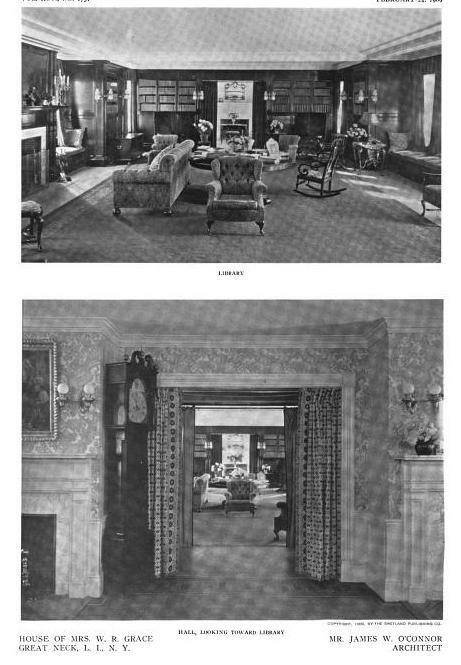 Photos from American Architect & Architecture, 1909. The original house appears to have been expanded & remodeled beyond easy recognition ... at least my easy recognition. Whoa! Doug isn't kidding. I can't find this house within the one on Bing, either. Not from any side. My opinion: the house on an island in Maine -- yes; the yacht with a deck that looks like Monaco -- yuck! 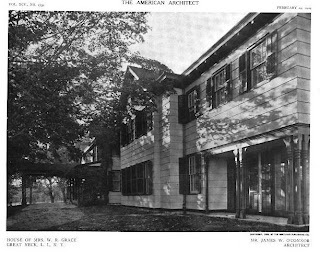 I thank Ancient & Dilettante for linking to the house & boat because on this night in 1883 Alva & William K. Vanderbilt gave the ball at their newly-constructed house at 660 Fifth Avenue that is widely credited with "kicking open the gates to the Gilded Age." Ah money -- what to do with it? 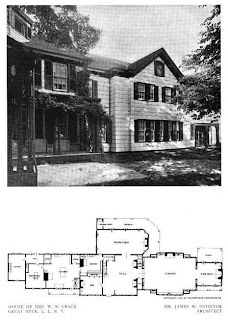 Doug, the Grace house in Maine was designed by Wilson Eyre. The setting is incomparable, and the neighbors past and present include Sister Parish, John Travolta, Kirstie Alley, Marshall Field's granddaughter Marina Rust--who still occupies his former summer house nearby (what? you thought Caumsett was the only one?). But I digress: I should have mentioned that Mrs. WR Grace---Lillius---was a native of the Maine Coast, and that for many years in her memory the Grace Institute operated a branch in the village of Tenants Harbor in her memory, teaching skills to local youth. I've always thought the Grace Estate up in Islesboro, ME to be a very handsome residence and structure by Eyre. Perhaps jaded by the burden of other municipalities but the taxes of $36,658 year are surprisingly low - even for a seasonal estate. Yet its languished on the market for a couple of years without a budge on the price. Kellsboro, astute observation. Taxes are low compared against similar properties in other places. Dark Harbor on Islesboro is one of the half dozen 'best' addresses on the Maine Coast, but the only 7 digit sales in this region have been on Mt. Desert Island, where Northeast Harbor has been having a bit of a Hamptons effect. But otherwise, 2-5 million constitutes the high end, and quite a bit is languishing on the market in that range up and down the coast. And away from the fancier summer colonies, even the handsomest of city houses in Portland, in the best neighborhood, pass the million mark.